Ms. Decima Smith was handed the keys to her new home completed under the Social Housing aspect of the Housing Recovery Assistance Programme. Ms. Smith received a one bedroom, one bathroom home outfitted with a kitchen, living/dining area and porch on Thursday, January 3. Her home is one of 22 Social Homes that will be built under the Housing Recovery Assistance Programme. Premier and Minister of Finance, Dr. the Honourable D. Orlando Smith, OBE, was present at the handing over ceremony and said that over the years, the Ministry of Health and Social Development has been engaged in several social initiatives related to social housing for people who are disadvantaged. The Premier added that the Government was inclined to support persons without insurance who needed financial assistance through this programme and efforts will continue. Minister for Health and Social Development, Honourable Marlon Penn thanked all involved in making the handover a reality, adding that after the hurricanes places such as Long Bush, Lower Estate and East End were left as a wasteland and the symbolic passing of the key was one of many that will happen over the next few months. Honourable Penn commended former Minister of Health, now Leader of the Opposition, Honourable Ronnie W. Skelton for being the catalyst behind the Government accessing the funds to begin the housing process. “I have inherited some of his hard work and I will continue to help other persons who need assistance to get back into their homes, to get the repairs going, to rebuild this country to where it was and beyond its former glory,” the Minister said. Meanwhile, Ms. Smith said that she is extremely grateful to the Government for their generosity in helping to rebuild her home. She extended her thanks to everyone in the community who helped her. 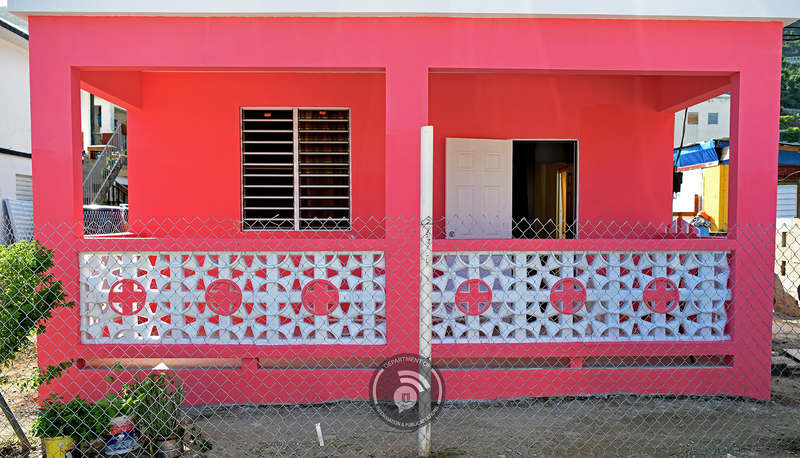 Minister for Communications and Works and Fourth District Representative, Honourable Mark Vanterpool said that he too was pleased that through the Government, Ms. Smith has relocated back into her home after being displaced. The Housing Recovery Assistance Programme is designed to help homeowners rebuild in the wake of Hurricanes Irma and Maria in accordance with the provisions of the Virgin Islands Housing Recovery Policy and Hurricane Irma Housing Recovery Plan 2017-2019. $15 million dollars was allocated to this programme. To date, 113 persons have been approved for a grant under the programme and further housing assistance may be provided to approximately 85 potential beneficiaries through soft loans at the National Bank of the Virgin Islands.